My husband came home from shopping with a whole pork belly today, it is a cut of meat we actually do like. We don't have it very often, simply because I love variety in cooking, I cannot cook the same things over and over, bores me. Anyway I didn't feel like roasting it, like I normally do, so I decided on Salt and Pepper Pork as it is such a low fuss meal to make. Is it healthy, no (it is deep fried), but do I have it all the time, no, so do I care that it isn't healthy, no. Does it taste great, absolutely. This meal is so easy to make, but the end result is delicious. 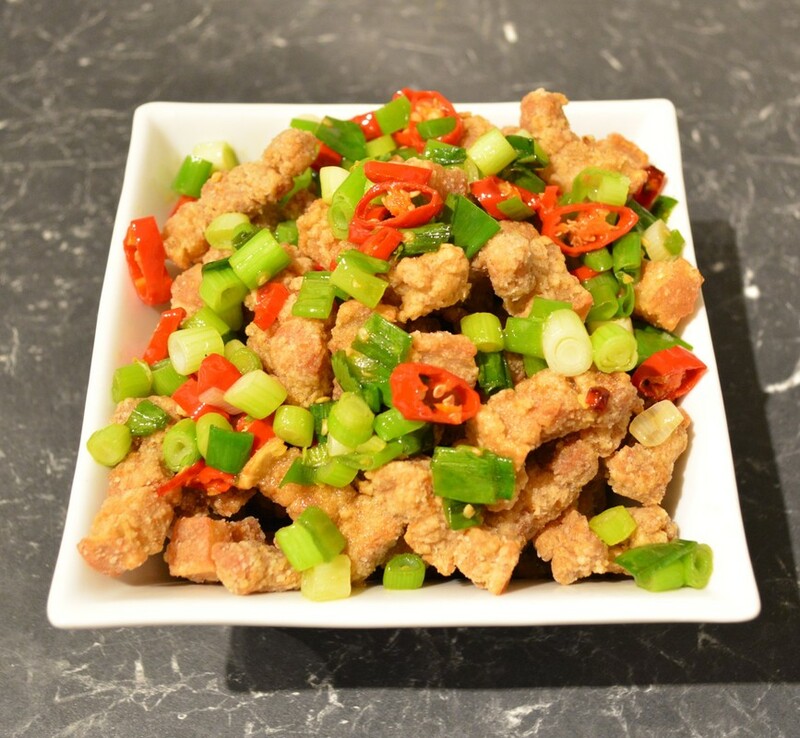 Don't be tempted not to add the spring onions and chilli, it is essential for added flavour. 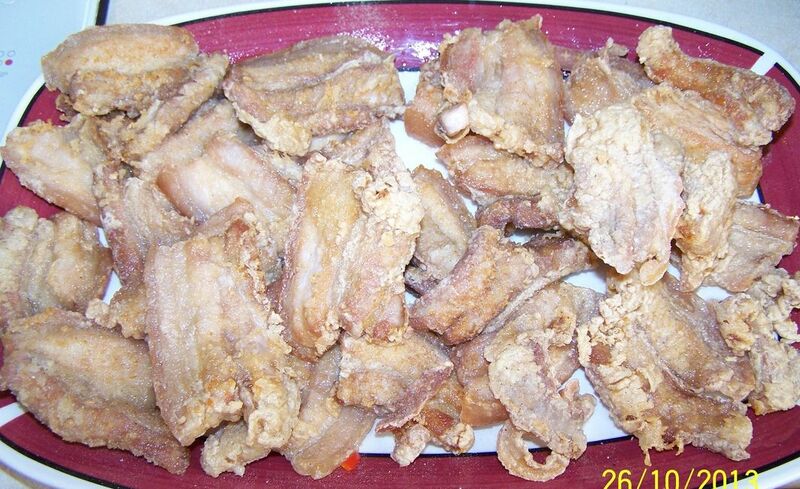 Now you can just slice the meat up into thin slices and fry them whole, as pictured below. 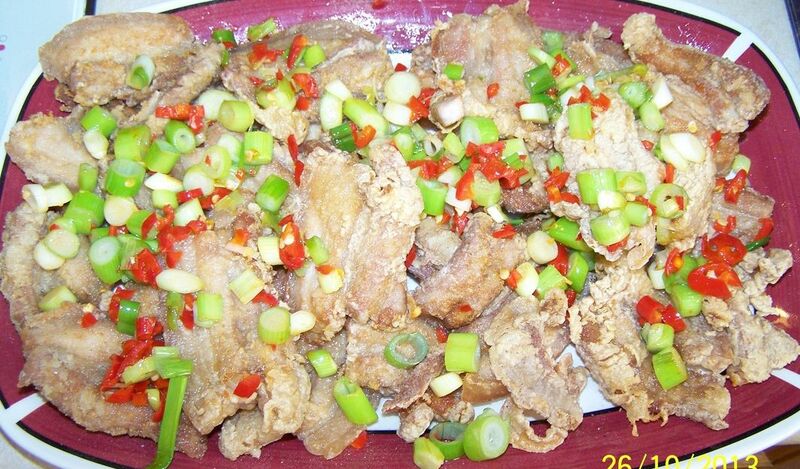 This works as a meal, but what I love to do is after I slice up the meat, I then slice up each piece into 1cm pieces and it is like popcorn pork, like in the photo above. It fries up beautifully and cooks really quickly. We like to have it with Bok Choy, a side of steamed rice goes well with it also. This is great finger food for a party, if you cut it up small, or simply a great quick mid week meal when you are time poor. Put your rice in your rice cooker, start that cooking while you get on with the pork. Slice the pork belly into 1/2-1cm thick slices. You can now also cut it up into bite sized pieces if you like. In a large bowl add the pork, garlic, soy sauce and dry sherry. Mix to combine. Allow it to marinate for at least 20 minutes, give it the occasional stir. In a medium sized saucepan or wok, add enough oil to come up 3-4cm up the side of the saucepan. The oil is hot enough when you drop in a small piece of bread and it sizzles immediately. When the oil is ready, dust the pork in the flour mixture, add it to the oil. Do not overcrowd the pan as you will stew the pork, not fry it. I did approximately 5-6 slices at a time. Fry for 3-4 minutes or until just golden and cooked through. Place on a paper towel lined plate. Repeat until all the pork is cooked. Now I taste the pork, if it needs a little more salt and pepper, just sprinkle on a little more while the pork is still warm, until you are happy with the taste, for me it really just needs a little sprinkle at this stage. Cover the cooked pork loosely with foil while cooking the remaining pork, to keep it warm. To a frying pan add 2 tablespoons of the frying oil. Heat over high heat, add the chillies and green onions, stir fry them for a minute or 2, or until they just start to soften. Sprinkle the green onion mixture over the pork. Serve immediately while still hot with the bok choy with garlic, honey and soy and the steamed rice.